Haematoxylin or hematoxylin (/ˌhiːməˈtɒksᵻlᵻn/), also called natural black 1 or C.I. 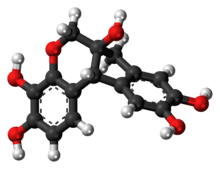 75290, is a compound extracted from the heartwood of the logwood tree (Haematoxylum campechianum). 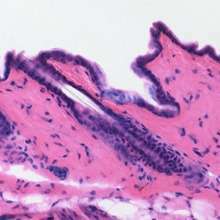 Haematoxylin and eosin together make up haematoxylin and eosin stain, one of the most commonly used stains in histology. This type of stain is a permanent stain as opposed to temporary stains (e.g. iodine solution in KI). Another common stain is phosphotungstic acid haematoxylin, a mix of haematoxylin with phosphotungstic acid. When oxidized, it forms haematein, a compound that forms strongly coloured complexes with certain metal ions, the most notable ones being Fe(III) and Al(III) salts. Metal-haematein complexes are used to stain cell nuclei prior to examination under a microscope. Structures that stain with iron- or aluminium-haematein are often called basophilic, even though the mechanism of the staining is different from that of staining with basic dyes. In the early 1970s and in 2008, there were shortages of haematoxylin due to interruptions in its extraction from logwood. The price of the compound increased, affecting the cost of diagnostic histopathology, and prompted a search for alternative nuclear stains. Before the use of any alternatives became firmly established, haematoxylin returned to the market, though at a higher price, and resumed its place in histopathology. Several synthetic dyes have been recommended as replacements, notably celestine blue (CI 51050), gallocyanine (CI 51030), gallein (CI 45445) and eriochrome cyanine R (also called chromoxane cyanine R and solochrome cyanine (CI 43820). All four have Fe(III) as the mordant. Another alternative is the aluminium complex of oxidized brazilin, which differs from haematoxylin by only one hydroxyl group. Mouse skin showing hematoxylin (nuclear/purple) and eosin (cytosolic/pink). These stains are commonly employed for histological studies. The mordants used to demonstrate nuclear and cytoplasmic structures are alum and iron, forming lakes or coloured complexes (dye-mordant-tissue complexes), the colour of which will depend on the salt used. Aluminium salt lakes are usually coloured blue-white, whereas ferric salt lakes are coloured blue-black. The three main alum haematoxylin solutions employed are Ehrlich's haematoxylin, Harris's haematoxylin, and Mayer's haematoxylin. The name haemalum is preferable to "haematoxylin" for these solutions because haematein, a product of oxidation of haematoxylin, is the compound that combines with aluminium ions to form the active dye-metal complex. Alum haematoxylin solutions impart to the nuclei of cells a light transparent red stain that rapidly turns blue on exposure to any neutral or alkaline liquid. Alum or potassium aluminium sulfate used as the mordant usually dissociates in an alkaline solution, combining with HO− of water to form insoluble aluminium hydroxide. In the presence of excess acid, aluminium hydroxide cannot be formed, thus causing failure of aluminium haematoxylin dye-lake to form, due to lack of OH− ions. Hence, acid solutions of alum haematoxylin become red. During staining, alum haematoxylin-stained sections are usually passed on to a neutral or alkaline solution (e.g., hard tap water or 1% ammonium hydroxide) in order to neutralize the acid and form an insoluble blue aluminium haematin complex. This procedure is known as blueing. When tap water is not sufficiently alkaline, or is even acidic and is unsatisfactory for blueing haematoxylin, a tap water substitute consisting of 3.5 g NaHCO3 and 20 g MgSO4.7H2O in one litre of water with thymol (to inhibit formation of moulds), is used to accelerate blueing of thin paraffin sections. Addition of a trace of any alkali to tap or distilled water also provides an effective blueing solution; a few drops of strong ammonium hydroxide or of saturated aqueous lithium carbonate, added immediately before use, are sufficient for a 400 ml staining dish full of water. Use of very cold water slows down the blueing process, whereas warming accelerates it. In fact, the use of water below 10 °C for blueing sections may even produce pink artifact discolourations in the tissue. Brown, G. G. (1978). An Introduction to Histotechnology. Appleton-Century-Crofts, New York. Dapson R., Horobin R.W., Kiernan J.A. (2010) Hematoxylin shortages their causes and duration and other dyes that can replace hemalum in routine hematoxylin and eosin staining. Biotechnic & Histochemistry 85(1): 55-63. Meloan, S. M. & Puchtler, H. 1987. "Harris hematoxylin," what Harris really wrote and the mechanism of hemalum stains. Journal of Histotechnology 10: 257-261. Puchtler, H., Meloan, S.N. & Waldrop, F.S. 1986. Application of current chemical concepts to metal-haematein and -brazilein stains. Histochemistry 85: 353-364.